The University of Rhode Island Peers Leading Educating and Supporting Everyone (PLEASE) group will hold its fourth annual Take Back the Night event Thursday, April 27. Take Back the Night is a nationally recognized event, which originated the ‘70s alongside the feminist movement. The event takes place in three parts, from 6 p.m. to 9 p.m., beginning with a keynote speaker in Quinn hall from 6 p.m. to 7 p.m. At the speaking portion, they will be reading sections from the book “We Believe You,” which was written by the two women who put together the movie called “The Hunting Ground.” The book itself is a collection of stories from people who survived sexual assault. At 7 p.m. the group will begin their march around campus. “We chant, we make picket signs and we have a banner we take with us,” said PLEASE Student Coordinator Hannah Woodhouse. According to Woodhouse, their actions of chanting tend to draw people out of their dorms to see what is going on. In some cases, they’ll even join the march. “It’s our most gutsy way of saying who we are and what we are passionate about,” Woodhouse said. “It’s very powerful.” Some people join the march while it’s going, Woodhouse saying that they usually are a bigger group at the end then at the beginning with all those that join throughout the event. She said that last year they ended up with about 40 to 50 people at the end and are hoping for more this year. The event ends with a candle lit vigil from 8 p.m. to 9 p.m. on the quad, which recognized not only for those affected by sexual assault at URI, but also for those around the world who are or have been affected. This entire week was filled with events that PLEASE put on with Student Senate and the URI Women’s Center. They hosted programs dedicated to raising awareness about sexual violence on campuses and interpersonal violence in general with a goal to help end it. There were many different events held to raise awareness such as Peer Pong, an event to get to know PLEASE, and Denim Day, which asked people to wear jeans to protest sexual violence. One of the last events being held on Saturday, April 29 is the Day of Accountability: Students for Violence-Free Campuses. It is through the Rhode Island Student Collaborative and with different colleges in Rhode Island, they will put on a demonstration at the State House to give their demands to the colleges regarding Title IV. PLEASE is a social justice based organization working to end interpersonal violence, according to Woodhouse. The group mainly works to achieve this through education. 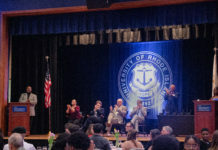 Each year, PLEASE presents to thousands of incoming freshman through a collaboration with URI 101 program. The presentations alert students to signs of interpersonal violence and also give them the tools to be an active bystander. PLEASE also has initiatives with different groups on campus and help to educate students all across campus. “We’re very passionate activists that care about this issue,” Woodhouse said. Next articleSex and the Cigar: STI Fact or Fiction?